Earlier this month, we featured advertisements from Japan's prewar Art Deco golden age, a period that shows off one facet of the country's rich graphic history. While all forms of Japanese design remain compelling today, any time or place would be hard pressed to compete with the world of Japan's pre-war print advertising. It has, especially for the modern Westerner, not just a visual novelty but a commercial novelty as well: as often as not, surviving examples glorify now-restricted addictive substances like alcohol and tobacco. At Pink Tentacle (a completely safe-for-work page, believe it or not), you can find a roundup of Japanese print advertisements for products that tap into just such vices. 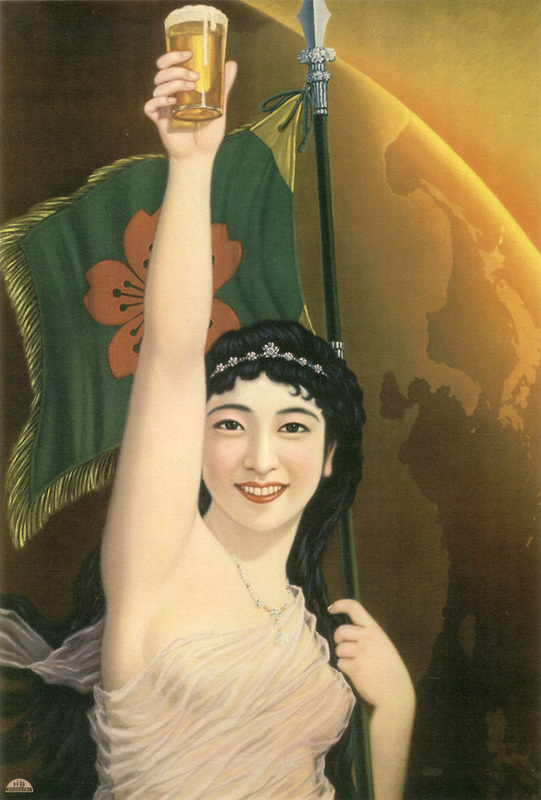 Japan opened up to the world in a big way in the mid-to-late 19th century, and the country's acceptance (and subsequent Japanification) of all things foreign kept chugging along right up until the Second World War. 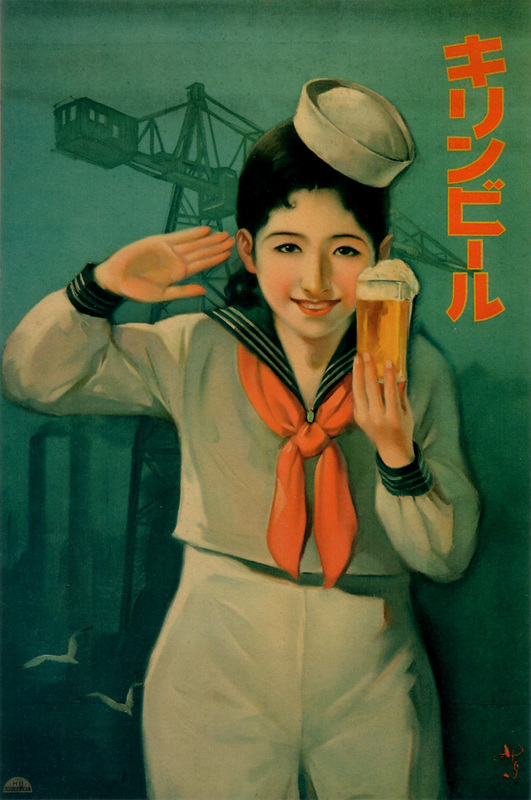 At the top, we have an appealing example of this internationalism at work in the service of Sakura Beer in the late 1920s. 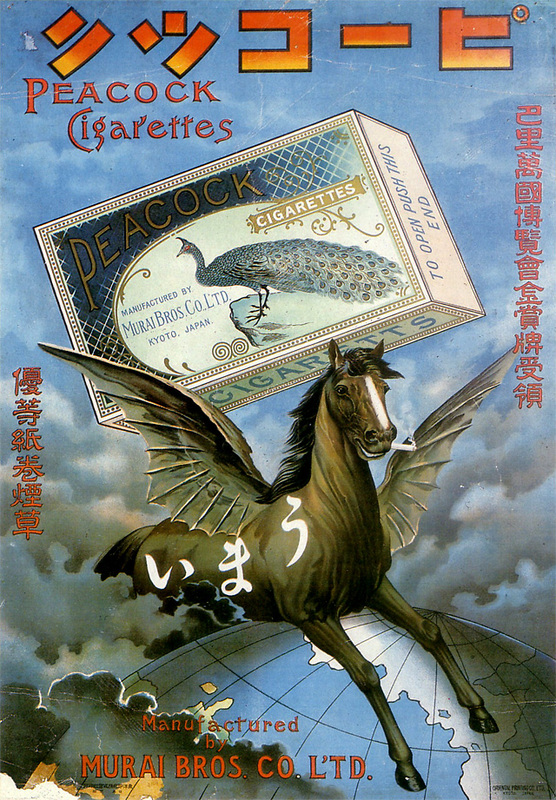 The 1902 ad just above depicts not just the globe but a smoking Pegasus astride it in the name of Peacock cigarettes. 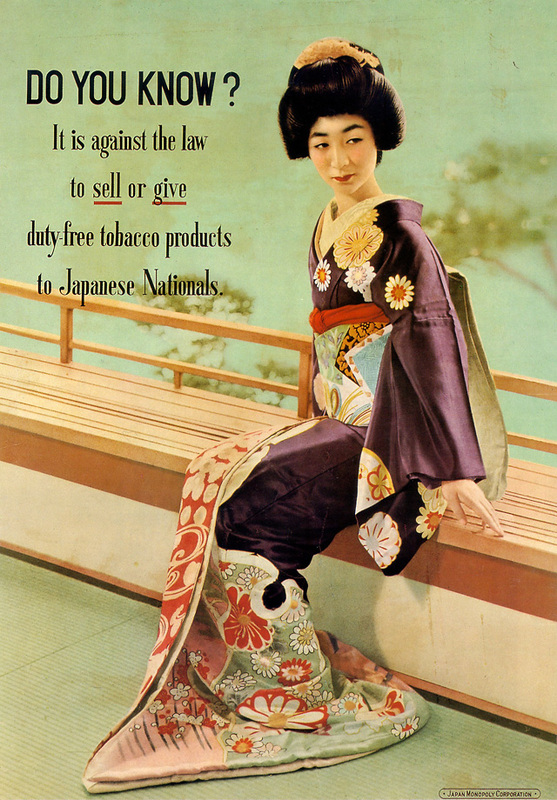 When the tone of Japanese life got militaristic in the 1930s, so did the tone of Japanese ads. The 1937 poster just above proclaims "Defense for Country, Tobacco for Society," a message brought to you by the South Kyoto Tobacco Sellers' Union. 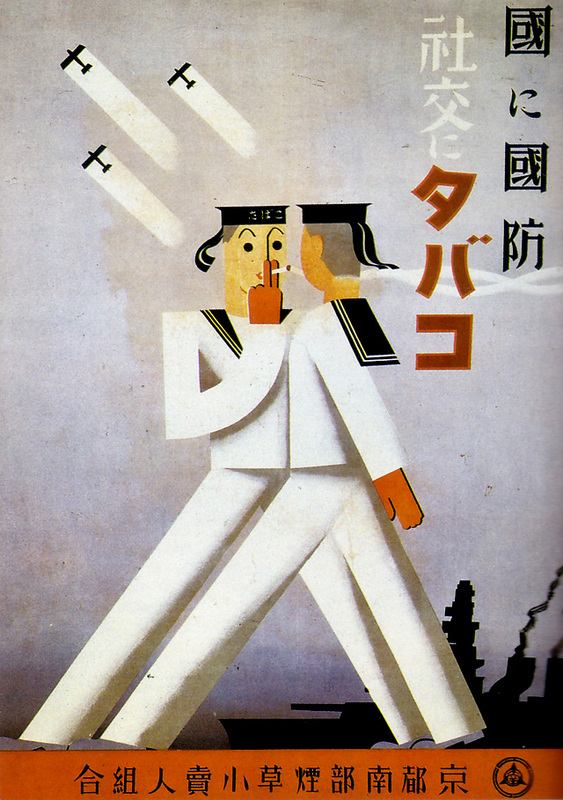 Below, the kind of Japanese maiden prewar graphic design always rendered so well appears in a different, more outwardly patriotic, and much more naval form. A valiant effort, but from the stories I've heard of the occupation, no amount of graphic design could've shut down that particular black market. And finally, no look back at vintage Japanese ads would be complete without including one advertisement for sake. 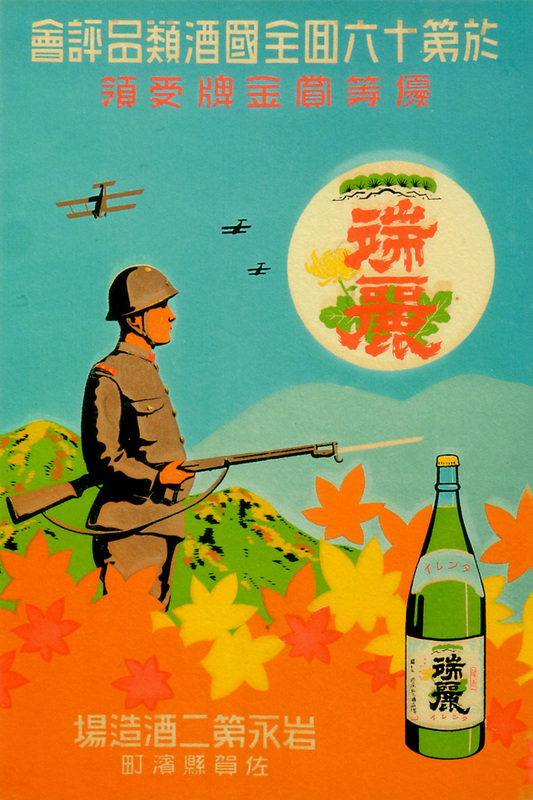 The ad below is for Zuigan sake, created in 1934. Haha! The horse-cigarette ad made my day.